Help with choosing coffins and caskets - Peter Barnes Funerals supply a wide range of styles to suit any wishes or budget for burial or cremation. The task of making the right choice can weigh heavily, we are here to support you and to help you make the best choice. We are experienced in working with families in a sensitive manner to ensure this will be a positive experience when funeral arrangements are underway helping you to be satisfied that you have made the right choice. If you have any questions about our range please let us know. Oak veneered coffin with single mouldings and a flat lid. Fittings available in Electro Brass (as shown) or Nickel Plate (Silver). 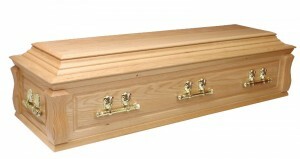 Mahogany veneered coffin with single mouldings and a flat lid. Fittings available in Electro Brass (as shown) or Nickel Plate (Silver). 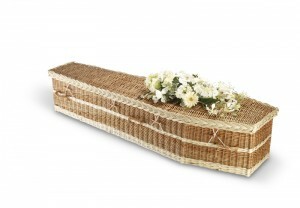 Panelled Oak veneered coffin with single mouldings and a beaded lid. Fittings available in Electro Brass Bar (as shown) or Nickel Plate (Silver). Superior solid oak casket, panel sides and panel ends, double raised lid with shaped corner posts. Fittings available in Electro Brass Bar (as shown) or Nickel Plate (Silver).